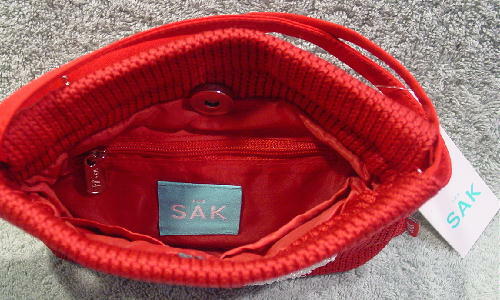 This never-used The SAK tomato red purse has a close knit fabric surface. 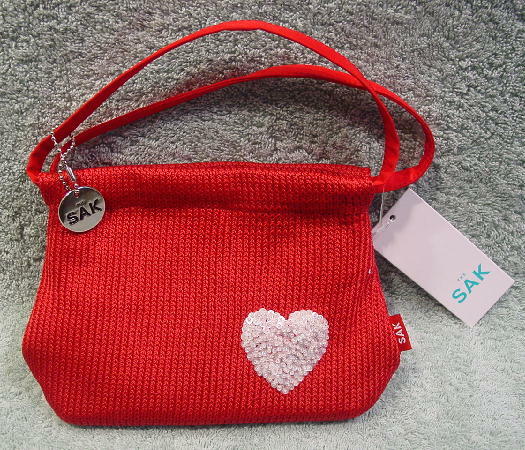 It has a red and white The SAK tag attached to the left side seam. 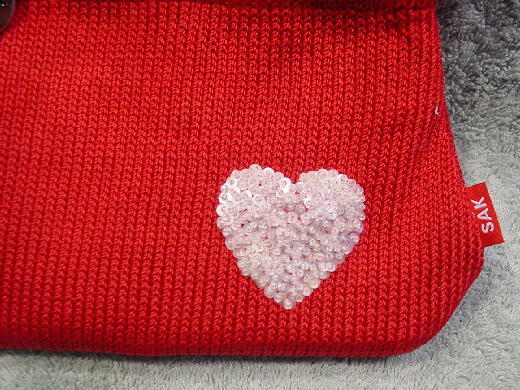 On the lower front is a small white heart with tiny white pearlized sequins with tiny iridescent beads in each center. There is a magnetic snap closure 1 3/4" down in the interior. The lining is a double sided synthetic red fabric. The interior back side has a zippered pocket with an info card from the company. The silver-tone zipper pull has an elevated The SAK on both sides. The front interior has two large open pockets with three small open slots on the right one. There is a turquoise and white logo tag on the front of the zippered pocket. There are two 11 3/4" by 3/8" fabric handles with a 3 3/4" drop and the manufacturer's tag is attached to one. The other handle has a circular silver-tone ornament with The SAK etched on it. The bottom panel has some body to it. We also have a larger version of this purse.